We understand the complexities of everyday life, and the scheduling required to achieve every goal families set forth, so don’t feel pressured or obligated to a specific date and time. Aviator Sports Summer Day Camp welcomes you to pick the time and date that works best for you and your families calendar! Please fill out the below information and a Camp Staff member will reach out to you to confirm availability and work to make sure your private tour is as personalized as can be based on your child’s camping needs. 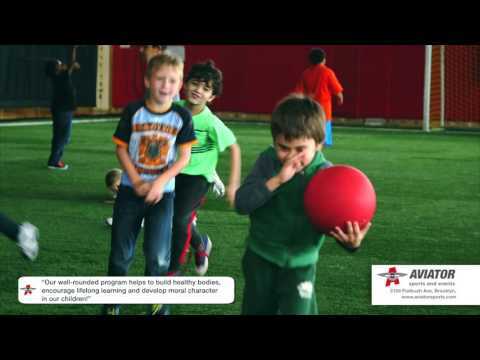 With a wide range of activities made possible by our 175,000 square foot facility introducing new sports, activities, and educational activities to hundreds of children annually. Aviator offers three camps programs specifically designed to cater depending on your child’s interests whether it’s professional homework aid, a fun place to visit over holidays or summertime adventures. Our After-school program is intended to cultivate patience in an environment that promotes positive reinforcement and concentration in a generation where attention spans are shorter than ever. Summer Day Camps are all-encompassing camps experience where sports, arts, culture, and social development are all given equal attention that allows for universal enjoyment and encourages being proactive in trying new hobbies. Summer Sports Camps are more concentrated in catering to a child’s attachment to a specific sport. Our camps have features and activities that encourage self-confidence, social skills, and leadership qualities. Aviator Camps features an extensive bus service that picks up your child within two blocks from your home throughout Brooklyn and Queens. Save yourself from the pressures of rushing out of the house in the early morning and rushing home at the end of the day, we offer options for early pickup (7:30 a.m) and late stay (6:30 p.m.) available at your own convenience. During these prolonged periods, campers will be participating in various activities throughout the facility. Ask our camps department if our bus service extends to your area. Contact our Camps Department at 718-758-7518 or email camps@aviatorsports.com. Our After School Program offers professional homework aide and helps to develop positive study habits and problem-solving skills. If you’d like to register please call 718-758-7518. Throughout the school year, we offer a day program on most school holidays. Drop the kids off in the morning before you go to work, and simply pick them up on your way home for the day. At Aviator Sports Summer Day Camp, our adventures include activities that will help children develop leadership qualities, self­ confidence, moral character, vital social skills, healthy living habits as well as knowledge of their environment, culture, the arts, and many sports.